Looking for a tasty appetizer to serve at your next party? 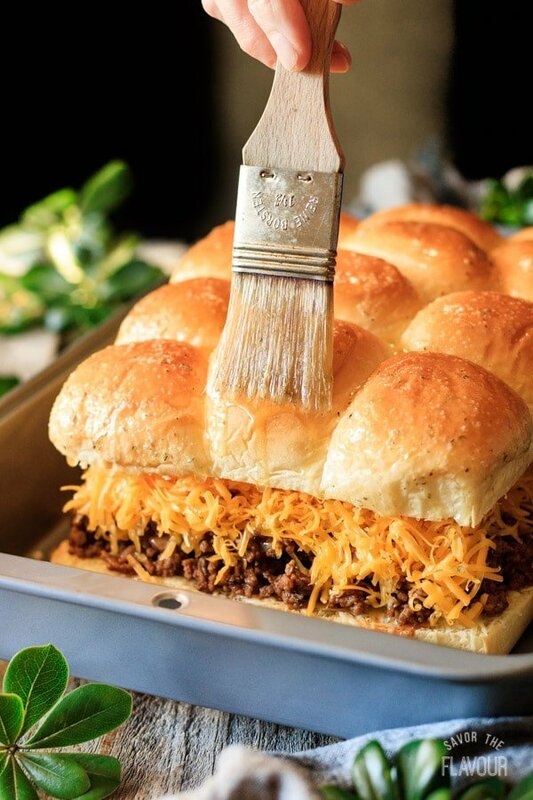 Try our cheesy sloppy joe sliders. 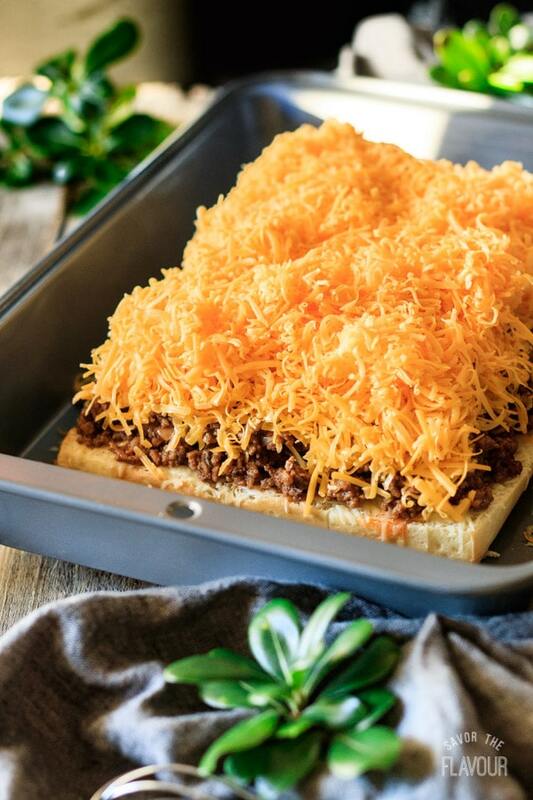 They are baked in the oven and boast two kinds of cheese. 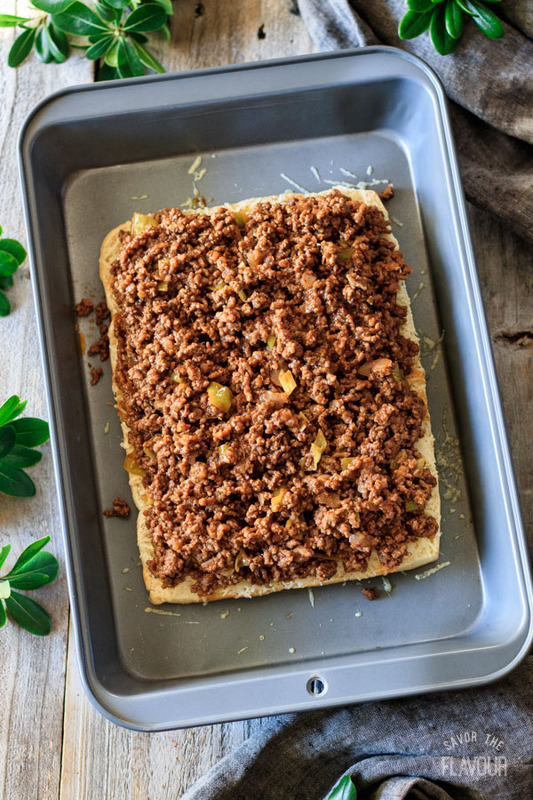 Our sloppy joe sauce is tangy, sweet, and full of flavor. It’s a perfect a cold weather comfort food that is also weeknight friendly. 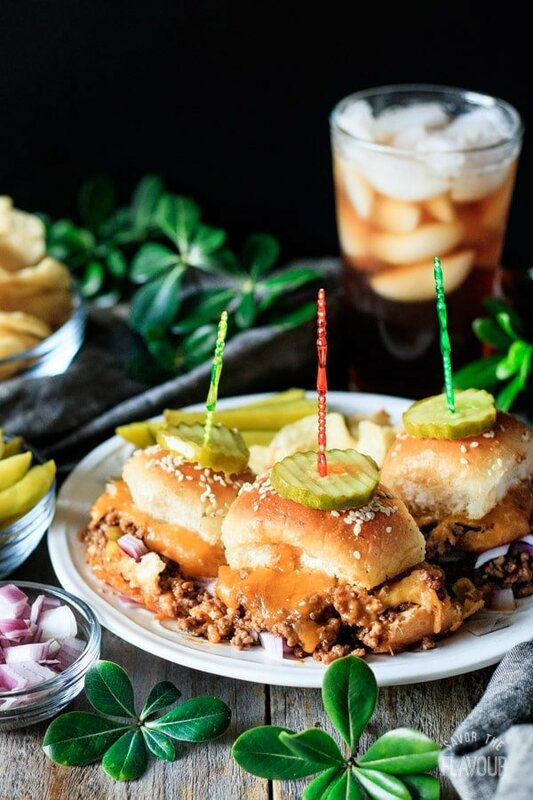 What are the best buns for sloppy joe sliders? Slider buns should be soft, squishy, spongy, and slightly sweet. They are smaller in size then regular buns. The most popular buns to use are Hawaiian rolls, but potato rolls are a popular second choice. If you plan on making your own buns, the dough will be a wet, flowing dough. The trick is to keep the dough cold and work quickly. 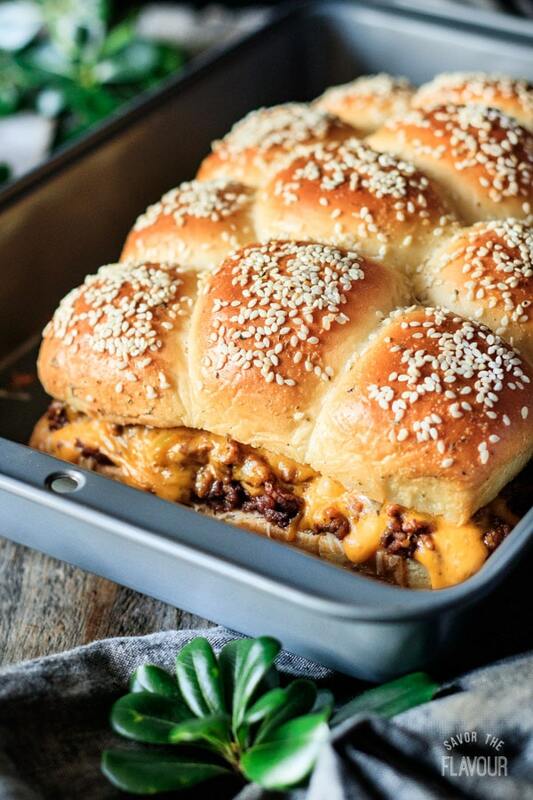 Place the buns close together in a rectangular baking pan with high sides. 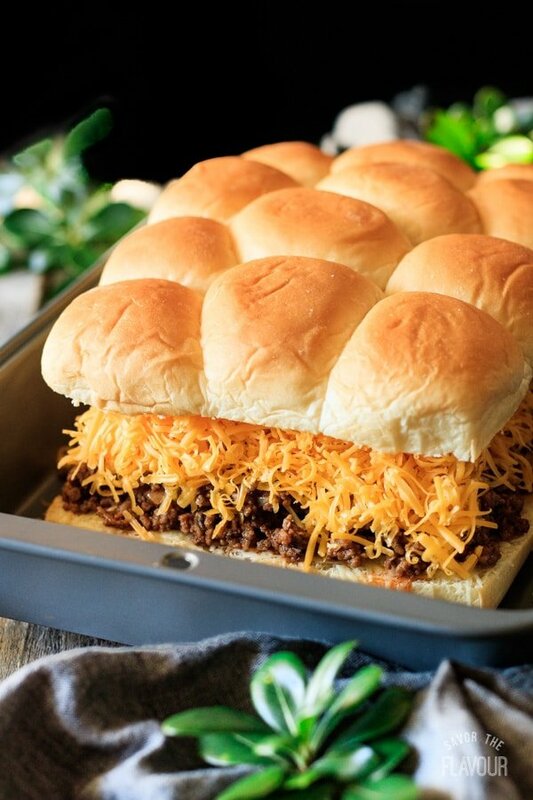 What kind of cheese do you use for sloppy joe sliders? 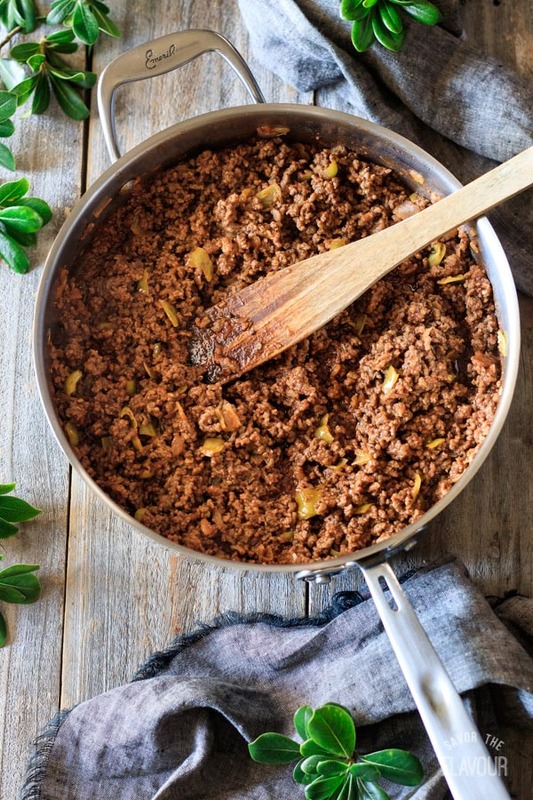 How do you make sloppy joe in the crock pot? Brown the ground beef, onion, and garlic in a skillet. Transfer the meat mixture to a crock pot. Stir in the liquids, spices and sugar. Cover. Cook on high for 2 hours or on low for 4 to 8 hours. 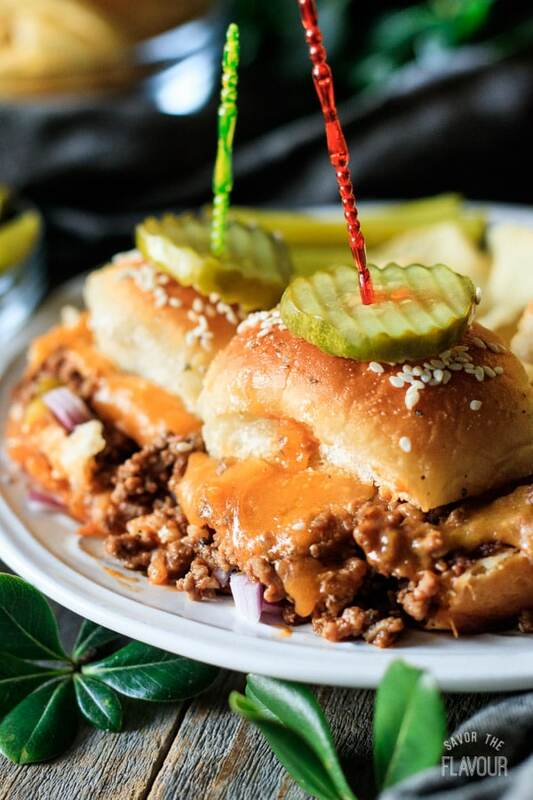 What are the basic parts of a sloppy joe slider? 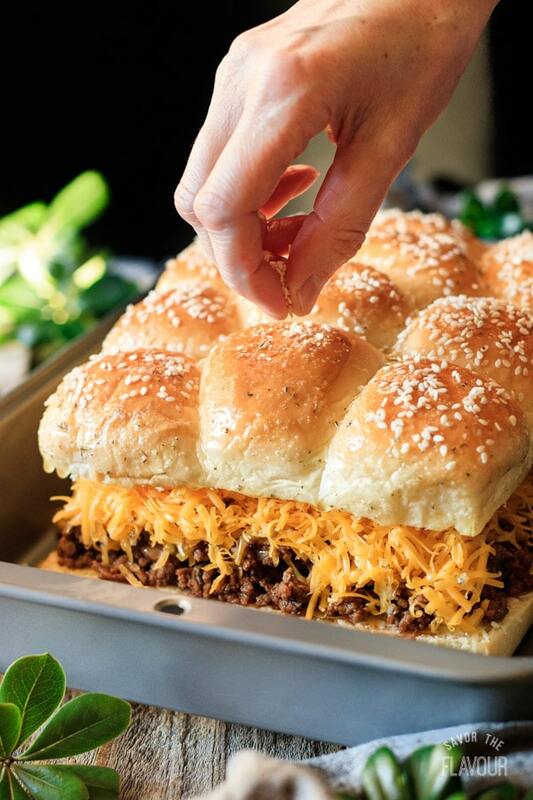 How do you make a cheesy sloppy joe slider? 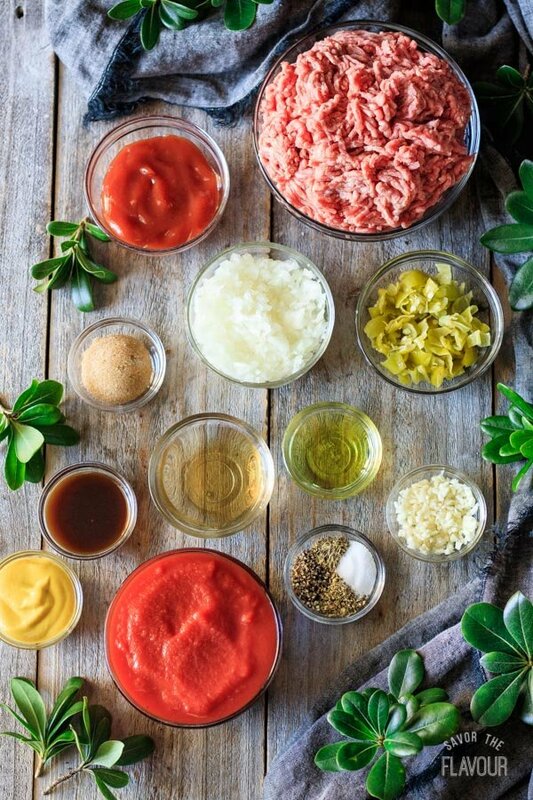 Gather all the ingredients for the sloppy joe mixture. Chop up the onion and pepperoncini, then mince the garlic. Heat up the oil in a large skillet until hot. Break up the meat and stir it occasionally as it browns. 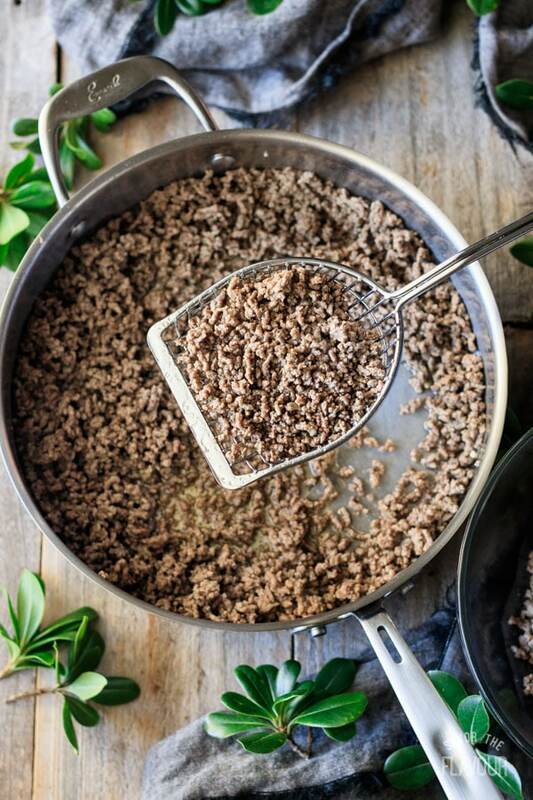 Drain the fat from the ground beef, but keep 1 tablespoon. Set the meat aside. 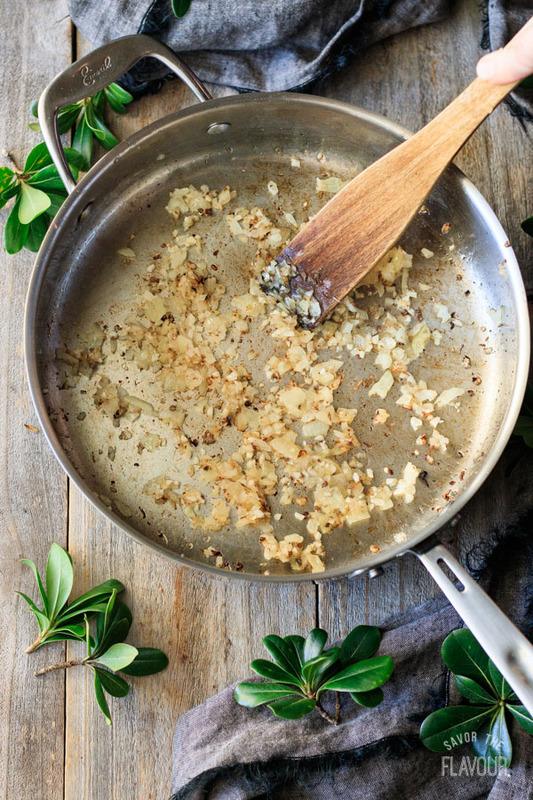 Sauté the onion in the rendered fat until soft, then add the garlic and cook for a minute. Add the pepperoncinis, liquids, beef, and spices. Stir until well combined. Reduce heat to medium low and simmer for 15 minutes. 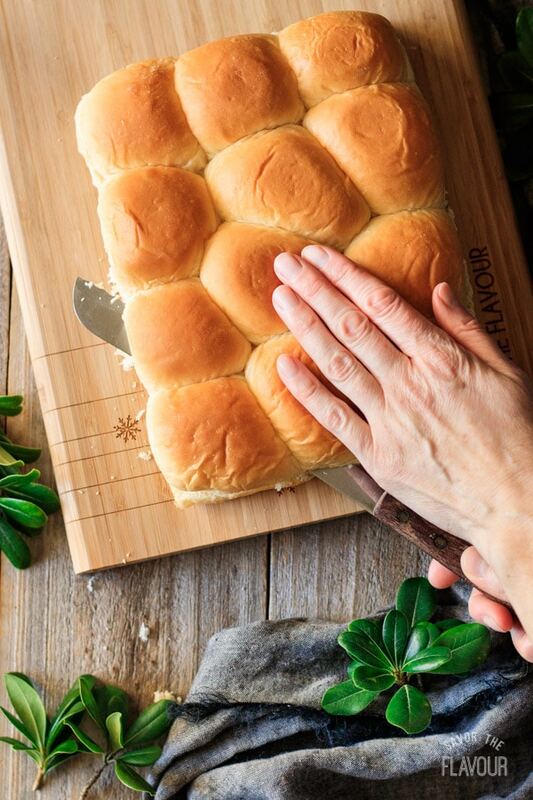 Place the bottom half of the rolls in a baking tray with sides. 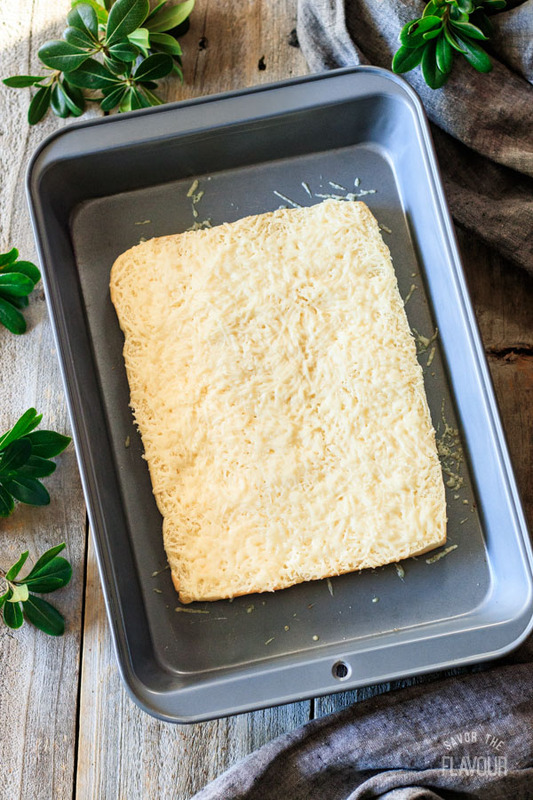 Sprinkle the freshly grated Parmesan cheese on top. Bake for 5 minutes at 350 F or until melted. This step keeps the bottom buns from getting soggy. Spread the meat mixture on the buns. Place the top half of the buns back on. 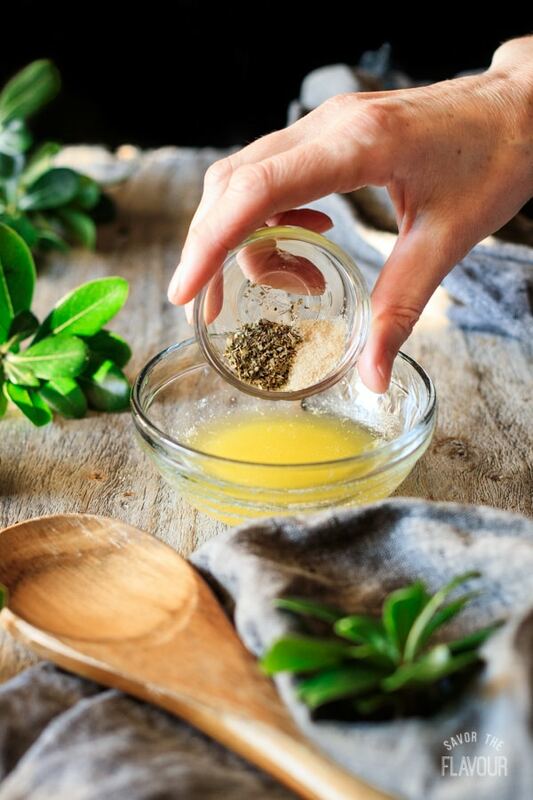 To make the glaze, melt the butter and whisk in the spices. Brush the glaze on top of the buns. Cover with foil and bake for 15 minutes at 350 F. Uncover and bake for another 5 minutes to brown the tops. Open up the sliders and sprinkle on some red onion to provide some crunch and additional flavor. Garnish with a pickle slice and spear the slider with a decorative plastic pick or a large toothpick. This will help hold the slider together. Serve hot with pickles, chips and sweet tea. Want a different meat? 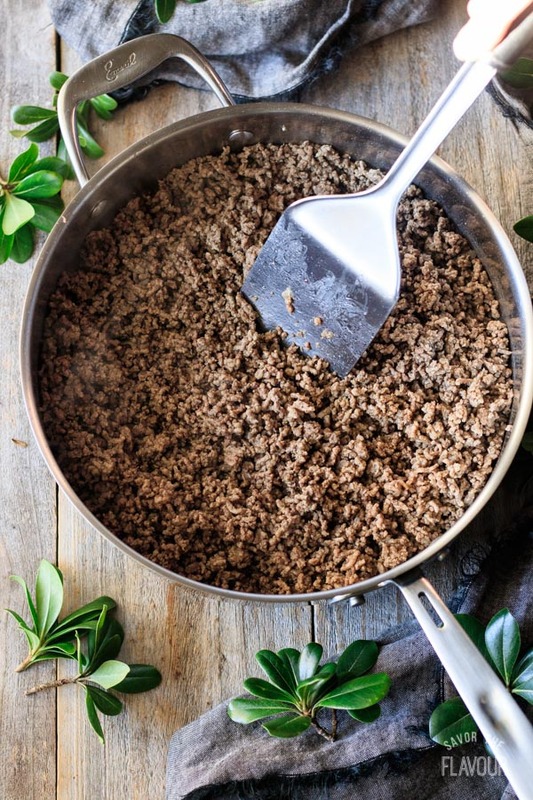 Use ground turkey or ground pork. Brown the hamburger in oil. It will crisp it instead of steaming it and will build flavor. The longer the sauce simmers, the darker, thicker, and sweeter it will get. Need a different sweetener? Try brown sugar, molasses, honey. Want it spicier? Use cayenne pepper, chili powder or crushed red pepper flakes. Want more veggies? Add grated carrot, chopped celery, green pepper, grated zucchini or mushrooms. Want less cheese? Stir some grated cheese into the meat mixture while it’s still hot and omit the rest. Want more glaze? Pour over top before and after baking. Don’t have sesame seeds? Swap it out for poppy seeds or chia seeds. 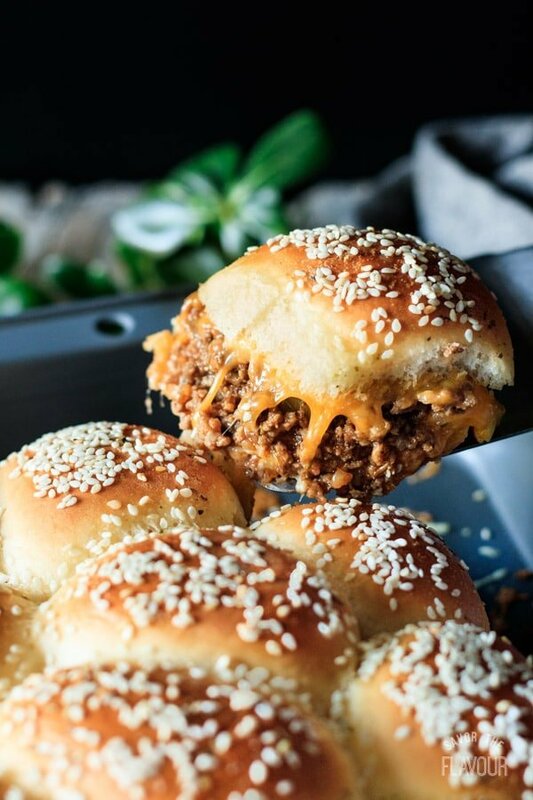 Cheesy sloppy joe sliders are simple to make and a lot of fun to eat. Make up a batch and watch them disappear. Looking for other meaty appetizers? Try these ones! 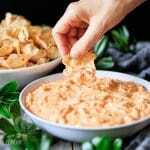 Buffalo Chicken Dip for a Crowd: this super easy dip is ready to eat in less than 45 minutes. 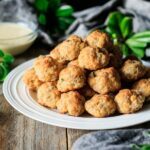 Easy Cheesy Sausage Balls for a Crowd: these little balls are moist, tender, and delicious with honey mustard! Polynesian Meatballs: water chestnuts add crunch to these mini sweet-and-sour meatballs. 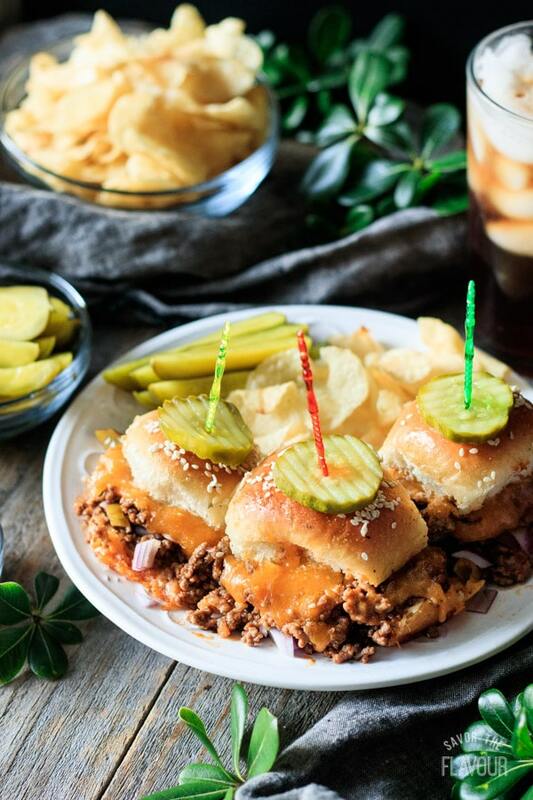 Did you make these cheesy sloppy joe sliders? Please leave a star rating below to share how you enjoyed it. Thank you, Kevin! Let us know if you make the sliders sometime!